I was afraid to try this sandwich. The TV commercials made it look so huge. 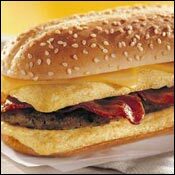 I knew that a big sandwich with bacon, sausage and cheese meant big calories and big fat. To prepare myself, I had healthy breakfasts of oatmeal and fruit for the two proceeding mornings. It all evens out in the end. That gave me two days to research the sandwich before trying it. Indeed, the sandwich is a nutritional nightmare. At 730 calories and 47 grams of fat, it has more calories and fat than Burger King's Whopper sandwich (700 calories and 42 grams of fat). But that bad news aside, it still looked like a breakfast lover's dream: a rich sausage patty, two eggs, two slices of melting American cheese and three crispy strips of bacon... all on what BK's website called a specialty bun. As a spokesman for breakfast, I often have to field questions over my seemingly dichotomous roll of promoting breakfast and promoting a healthy diet. Like other meals, breakfast has the potential to be either healthy or unhealthy and to me the answer is simple: everything in moderation. There's nothing wrong with eating a cheesy sausage sandwich once a week so long as you've had oatmeal, a healthy cereal or the like in previous days to balance your diet. I wondered how Burger King would address the hyper-dichotomy of their new "enormous sandwich" versus their simultaneous focus on healthier menu items. First, they make it clear that the big breakfast sandwich is designed for a particular breed of person - "people who like to start the day with a hearty breakfast." Denny Post, chief product officer at Burger King, goes on to say, "We're about having it your way. The guy who is a Whopper-head will find this appealing." Now, I could give a rat's bottom, about the Grateful Dead. But I was deeply offended by Mr. Post's use of the term "Whopper-head". I recognize that blank-heads, like cheese-heads is a popular way to describe a fanatical mental state. Cheese-heads are mental for Wisconsin. Dead-heads are mental for the ho-hum music and peaceful atmosphere of the Grateful Dead. But the term "Whopper-heads" stands opposite to other blank-heads in being neither self-imposed nor positive from a group perspective. It's a corporate label - an asinine and childish result of a business meeting. And if we refer to food categories as races, it's decidedly racist. "Drive up to the next window, Whopper-Head." "You like that big sandwich, Whopper-head? Mr Post went on to point out that Burger King offers plenty of healthy menu options if one doesn't happen to be a dirty Whopper-head. This morning I tried the Enormous Omelet Sandwich. It was okay. Nothing new. Nothing special. It wasn't nearly as big as the commercials would have you believe. The first bite seemed very buttery - unpleasantly so. But that taste dissipated as I continued to eat. The bacon and sausage had that friendly, familiar Burger King taste. The cheese was hardly noticeable - overpowered by the other ingredients. 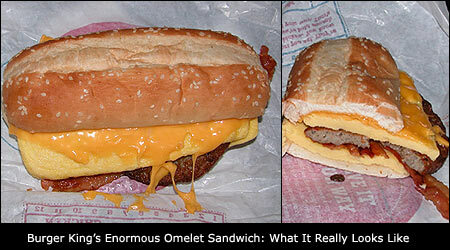 The most enormous negative of the Enormous Omelet Sandwich is the "specialty bread". Basically, they just chucked the stuff of a couple breakfast sandwiches into the bun of a chicken sandwich. Maybe I've been conditioned by the fast food restaurants, but I prefer the heartier casing of an English muffin or even a Croissant. The standard bun coupled with the soft egg creates a sandwich that could be described as being "squishy" on the whole. The Enormous Omelet Sandwich isn't really in the same league as McDonald's McMuffin Sandwiches or Burger King's own Croissan'whiches. Say what you will about them, they're special and distinctive. The Enormous Omelet Sandwich is what it is - tasty breakfast ingredients crammed in the bread of another sandwich. It isn't bad, but it's also not great. Add the taste and texture to what we know about its fat and calorie content and you end up with a sandwich that's best avoided. Price reflects meal deal with coffee annd hash browns. What do you think of Enormous Omelet Sandwich? 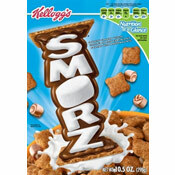 Dis right here is da shtuff!!! But... let's just say it tastes a lot better than it looks. Best sandwich to eat after a long night of boozing. I miss it!! I really enjoyed it the few times I tried it. I couldn't recommend eating them every day, but for those mornings when you needed more than the standard croissanwich they were great. I really miss them. I didn't like it either! Same thought I had, it just tasted like breakfast on a sub roll, and not in a good way. Definitely disappointing, I ended up taking it apart and making a meal of the "eggs", bacon, and sausage. The bread went well w/some ghetto cold cuts for lunch.